T HERE was once a Prince who wanted to marry a Princess; but she was to be a real princess. So he traveled about, all through the world, to find a real one, but everywhere there was something in the way. There were princesses enough, but whether they were real princesses he could not quite make out; there was always something that did not seem quite right. So he came home again, and was quite sad; for he wished so much to have a real princess. One evening a terrible storm came on. It lightened and thundered, the rain streamed down; it was quite fearful! Then there was a knocking at the town gate, and the old King went out to open it. It was a Princess who stood outside the gate. But, mercy! how she looked from the rain and the rough weather! The water ran down from her hair and her clothes; it ran in at the points of her shoes and out at the heels; and yet she declared that she was a real princess. 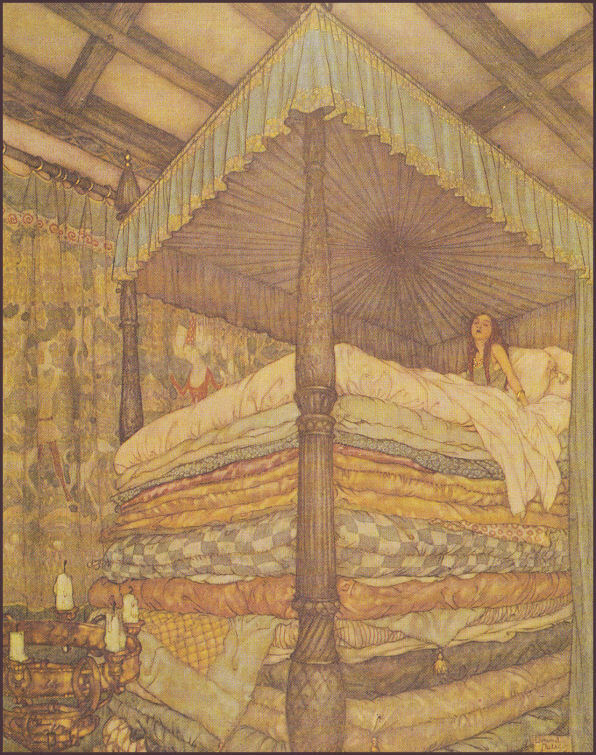 So the Prince took her for his wife, for now he knew that he had a true princess; and the pea was put in the museum, and it is there now unless somebody has carried it off. There was once upon a time a white dove that lived next door to a growly, grizzly bear. The dove had a voice as sweet as music, but the bear had a terrible growl. He was always snarling, growling, and quarreling, till the white dove said: "I cannot stand it any longer. I must find a new home." So, early the next morning, she started out to find the new home. First she went to the creek and dipped her wings in the shining water till they were as white as snow, and then away she flew, over the hills and the valley. So, early the next morning, she started out to find the new home. "Coo, coo! I should like to live with a good child," she said as she flew. By and by she came to a small, white house by the roadside, and there on the doorstep sat a little girl who looked so much like a good child that the white dove lighted on a tree by the gate and called, with her voice as sweet as music: "Coo, coo! may I come in? Coo, coo! may I come in?" But the little girl did not hear, for just then her mother called from the kitchen: "Little daughter, come here! I want you to rock the baby to sleep." And before the dove had time to call again the little girl began to cry as loudly as she could: "Boo-hoo! Boo-hoo! I—don't—want—to—come—in! Boo-hoo! Boo-hoo!" "Coo, coo," called the white dove. But it did no good, so she spread her wings and flew away. "I should rather live next door to a growly, grizzly bear," she said to herself, "than in the house with a child who cries like that." On and on she flew, over the tree tops and roofs, till she reached a big house that had a great many doors and windows. The windows were open, and, looking in, the white dove saw half a dozen boys and girls playing together. Oh! what a noise there was! The baby had waked up long before he was through with his nap, and he was crying about it, and the nurse was singing to him; and all the rest were running and screaming and jumping, till all together there was such a din that the white dove could not make herself heard, although she called many times. At last, however, somebody spied her, and then what a terrible time she had! Every child in the room began to push and scramble to get her. "She's mine!" "She's mine!" "I saw her first!" "You didn't!" "I did!" they cried, all talking at once, till the white dove spread her wings and flew away. "It would be almost as bad as living next door to a growly, grizzly bear to live in the house with all that noise," she said as she flew away. Her white wings were weary and she began to think that she would have to turn back, when she heard a sound as sweet as her own voice. It came from a brown house near by, and the white dove made haste to the door to find out what the sound was. All the pretty little horses." "Coo, coo! may I come in?" called the white dove softly at the door; and the little girl looked up. Now the child had often thought that she would rather have a white dove than anything else in the world, and she whispered back: "Dear dove, come in." Then the white dove went in and lived there all the days of her life and never had to go back to live by the growly, grizzly bear any more, for she had found a home with a good child, and that is the best home in the world. NCE upon a time there was a farm-house, and it was painted white and had green blinds; and it stood not far from the road. In the fence was a wide gate to let the wagons through to the barn. And the wagons, going through, had made a little track that led up past the kitchen door and past the shed and past the barn and past the orchard to the wheat-field. One morning in the winter, when snow was on the ground, Uncle John came in from the barn to breakfast. And when he came in, Uncle Solomon was there, standing by the fire. And Uncle John spoke to him. He said, "Father, there was a fox around in the night. I saw his tracks by the hen-house just now." And Uncle Solomon said, "Did you? Guess we better look him up." And little John was there, in the kitchen, and he heard what they said. But he didn't ask if he could go with them, because he knew they wouldn't let him. So, after breakfast, Uncle John got down the gun, and he cleaned it and made it all right, and then Uncle Solomon came along and they wrapped themselves up warm and went out. Outside was the dog, and he went with them. It was a hound, that is a kind of dog that likes to go after foxes, and Uncle Solomon and Uncle John wanted him to go, so that he could show them where the fox had gone. Then they went to the hen-house, to find the fox tracks, so that they could follow them. When they had gone, little John and little Charles watched from the window, and they saw Uncle Solomon and Uncle John walking along in the snow, after the dog, and they went across the fields, just the way the fox had gone. Then little John spoke to little Charles, and he said, "Come on, Charles." And little Charles didn't know where little John wanted him to go, but he put on his coat and his comforter and his cap and his mittens and his thick stockings, and little John wrapped up the same way, and then they got little Sam. So the three little boys started out of the kitchen door, and they walked quickly along the little track, past the shed and past the barn and past the orchard to the wheat-field, and they climbed over the bars and went across, and into the maple-sugar woods. Then they ran along the little road in the maple-sugar woods until they came to the right place to get out over the wall. And they went wading through the snow to the wall and little Charles climbed up. Then little Charles took little Sam's hand and pulled, and little John boosted, and so little Sam got up on the wall and down on the other side. Then the three little boys went wading across that field and the next field and the next, and they came to the wall that was beside the woods where they caught the woodchuck. And they walked along by that wall until they came to a corner, and then they all climbed up and sat on the top of the wall, on a flat stone. They looked all around, but they didn't see anybody, and they didn't know where to go to see Uncle Solomon and Uncle John hunting the fox, so they thought they would stay where they were, on top of that wall. And they sat there and listened and didn't make any noise, and pretty soon they heard the dog, far away, but they couldn't hear anything else. And little Charles looked one way and little John looked another way, and they all listened and kept very still. Then, all on a sudden, while little John was looking into the woods on his side, he saw the fox. The fox was trotting along, and not hurrying much, holding his tail up from the ground and turning his ears back once in awhile to listen. He didn't see the little boys, and he didn't hear them because they were so still. And he didn't smell them, because the wind was blowing the wrong way, so he didn't know they were sitting there on the wall. And little John gave little Sam a poke, very softly, and little Sam turned around slowly and saw the fox, and he poked little Charles. So they sat very still, watching the fox, and they wondered what he would do. While they watched him, the fox stopped and listened again, and then he looked at the wall, but not at the part where the little boys were. And he gave a little jump and ran right up the wall and stood on the top. And he was pretty near the three little boys. There he waited a little while, and he turned his head and listened again, and the noise of the dog was coming nearer. Then the fox began to look around, and at last he looked where the little boys were, so near. He was pretty near the three little boys. When he saw them, he was frightened, and he gave a jump, quickly, and ran along the wall until he came to another wall that joined on. And he turned off and ran along that other wall for awhile, until he came to a gate, and there he had to jump off and run in the snow. But he ran very fast, and in a little while the boys couldn't see him any more, he was so far off. So they sat there and waited until Uncle Solomon and Uncle John came along. When they had been waiting quite awhile, the dog came along just in the place where the fox had been. The little boys called the dog, but he wouldn't pay any attention to them. He scrambled up on the top of the wall, and then he sniffed around and ran along the way the fox had gone, and pretty soon he was so far off they couldn't see him, either. Then in another little while, Uncle Solomon, and Uncle John came walking along. Uncle Solomon saw the little boys and he said, "Hello, boys. Haven't seen a fox, have you?" And the little boys all called out, "Yes, we have." So little Charles told how the fox had come and climbed up on the wall, and when he saw them, he had run away, very fast. And then he told about the dog. And Uncle John stood up on the wall and looked all around, but he couldn't see the fox and he couldn't see the dog either. Then he asked Uncle Solomon what he thought they would better do. And Uncle Solomon said it wasn't any use chasing that fox, because he had gone too far away, and they wouldn't catch him. And Uncle John said that was just what he thought. So Uncle Solomon and Uncle John and the three little boys all walked along through the woods, and down the lane to the road, and along the road to the farm-house; and in at the wide gate and up to the kitchen door. And they went in and took off their things. But the dog didn't come home until the next day.